The run-up to Christmas is when the latest generation of e-readers with refreshed features and tweaked specifications try to lure us away from our printed books. The popular Amazon Kindle Paperwhite (2013) and the fun-sized Nook GlowLight have tempted a few, but how about a waterproof e-reader that doesn't mind being dunked in the tub? If that doesn't already sound like a tangible advantage over the old analogue books, the Kobo Aura H2O comes with a two-month battery, 4GB storage and the same crisp 256 dpi display as found in the Kobo Aura HD. In a market dominated by a mega-corporation (Amazon, obvs), the Kindle rivals have to have to offer something extra. But is a larger 6.8-inch screen, some clever content sharing functionality and a raincoat enough to justify a higher price than the market leader? The 6.8-inch screen is comparable to a paperback, but at 233g it's heavier than your average book and the Kobo's dimensions (179 x 129 x 9.7mm) make it fairly large for an e-reader too. If your arms are as feeble as ours, you'll want to use both hands to hold it. With the slightly soft textured rear panel, the Kobo is less likely to slip from your grasp than an iPad and its asymmetrical shape makes it look more interesting than a Kindle. On the whole, it feels robust enough to survive in the wild without the added protection of Kobo's optional Sleepcover – an additional cost of £29.99. The Kobo's best asset is the 1430 x 1080 screen, which at 265 DPI is almost print quality, while the so called ComfortLight illuminates the screen from the front, rather than backlighting, which reduces eye-strain. With the brightness at around 30%, the slightly off-white screen looks very much like the page of a book. The touchscreen is not capacitive like your smartphone, but it's fairly responsive and turns the pages promptly – even to a depth of one meter under water. No, there's no situation where that would be at all useful, but it means you can read in the bath without fear of sending your expensive device to a watery grave. Kobo cannot match Amazon for the size of its book catalogue, but with four million to choose from, the Kobo 'bookstore' is fairly well stocked and well priced. 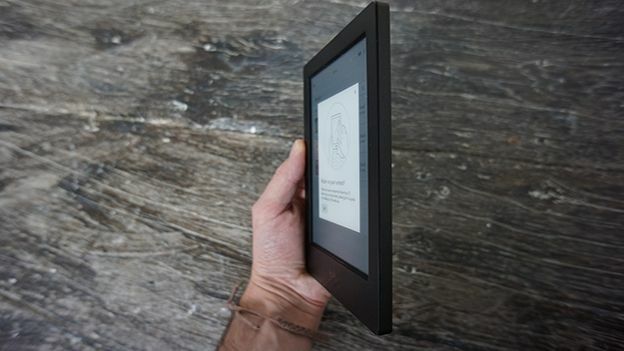 It takes a few more clicks to locate and buy a book than it does through Amazon's streamlined interface, but the Kobo's homepage is quite appealing in a simple E Ink monotone way. What's more, the books that we couldn't find in Kobo's bookstore were available elsewhere and the Kobo is not in the least bit fussy about book formats. The microSD slot offers a useful way of getting files onto your e-reader. We also appreciated the ability to alter the font size and indeed the font to suit. In addition to just reading, Kobo goes further than Amazon in encouraging the user to share quotes and content with your social media friends. If this encourages young people to read more, then it's a good thing, but you can just as easily ignore these features and enjoy the storey. In fact, less is often more with e-readers and 3G connectivity is a good case in point. In a world heading toward blanket Wi-Fi coverage, do you really need to download a book over 3G? If the answer is yes, Amazon will take your money, but the Kobo is sensibly, Wi-Fi only. And while we're on the subject, the 3GB inbuilt memory is enough for 3,000 books, which should be enough, but for those that always want more, there's also a slot for 32GB microSD cards and another 30,000 volumes. Having said that, we were a little disappointed to find that the subscription to T3 magazine we bought from the Kobo bookstore is not compatible with the Aura H2O. While it can display comics and PDFs, Kobo's e-zines are for the Kobo Android/iOS app. Battery life is quoted as two months, assuming 30 minutes of daily use. That's great if you're marooned on a desert island for 60 days, but we'd actually be happy to sacrifice some battery life in return for a lighter device and just recharge after each book. With it's realistic HD screen, subtle illumination and friendly home page, the Kobo Aura H2O is as user friendly as, well as a book. The advantage it has over other e-readers and indeed books, is a resistance to water that makes it the ideal bath or beach companion. Our perfect e-reader however, would be a little lighter a, touch thinner and good deal cheaper.